Two FREE Ocean Spray Juices Next Week! 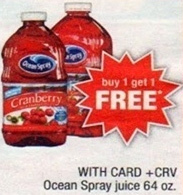 From 5/20 to 5/26, if your local CVS carries the Ocean Spray Cherry Juice Drink, then you can get two FREE 64oz. Ocean Spray Juices next week!